I received an email from a newly married home maker who is learning the nuances of Indian food cooking. She had a query for me – “How to make easy breakfast recipes that are not only tasty but quick to make as I need to fix my husband’s breakfast by 7.30 am?”. Over the years, I have received many such emails requesting for easy, quick to make and tasty recipes. I have shared a few tiffin recipes that include breakfast dishes that can be fixed in less than 30 minutes. I am sharing yet another South Indian breakfast recipe, Gojju Avalakki, that fits the bill and a much relished dish in our home. Gojju Avalakki also popularly known as Huli Avalakki is a Karnataka vegetarian breakfast dish this is prepared with beaten rice aka Poha or Atukulu. (Gojju = gravy and avalakki = beaten rice). 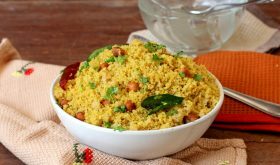 Beaten rice is ground to a coarse powder, dunked in a tamarind water that is sweetened with jaggery and spiced with rasam powder before sauteed in a tempering of spices and roasted peanuts and finally garnished with fresh coconut and coriander leaves. The roasted peanuts provide a nutty crunch that complements the tangy, sweet and spice flavors of this vegan dish. A variation is the addition of a ground mix of dry roasted black pepper corns and sesame seeds which flavors Gojju Avalakki with a surprising depth. Grind the beaten rice or poha coarsely like semolina. Wash the ground beaten rice and drain completely. Keep aside. Heat a stainless steel vessel, add 2 cups of water, grated jaggery, tamarind paste, rasam powder and salt to taste. Bring to a boil and simmer till the jaggery is completely dissolved, approx 3-4 mts. Turn off flame and allow to cool a bit, approx 7-8 mts. Sprinkle 1 1/2 cups of the prepared tamarind water over the wet poha, a little at at time and toss the contents such that its mixed thoroughly with the coarsely ground beaten rice. Sprinkle the remaining tamarind water such that the beaten rice is well coated with it. It should appear like a crumbled mixture. Place lid over the beaten rice mixture and allow it to sit for 15 mts. After 15 mts, if you feel that the mixture is too dry, add the remaining tamarind water and toss the contents and allow to sit for another 15 mts. Heat oil in a small pan and once it is hot, add the mustard seeds and allow them to splutter. Add the urad dal and allow it to turn red. Add asafoetida, turmeric powder, roasted peanuts and curry leaves and saute for few seconds. Crumble the beaten rice mixture into the tempering and mix thoroughly. Place lid and cook for 4-5 mts. Add the black pepper and sesame seeds powder, adjust salt and add more jaggery if required. Mix well, Turn off flame. Remove to a serving bowl and garnish with fresh coconut and fresh coriander leaves. You can use a mix of 1 tsp of rasam powder and 1 tsp of sambar powder OR use 2 tsps of sambar powder instead of rasam powder. The additon of the ground mix of roasted sesame seeds and pepper corns is optional. Peanuts, tamarind and jaggery are essential ingredients for this recipe. If you find that the mixture is dry after following Step 6 above, sprinkle some more water and mix. Place lid and cook for a a mt or two. By Sailu Published: November 20, 2013 Gojju Avalakki recipe aka Huli Avalakki is a Karnataka dish that is easy, tasty and instant. 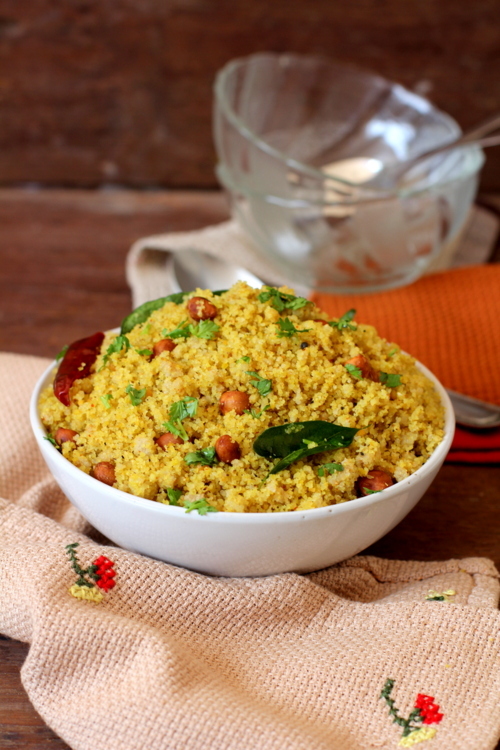 One of the quick South Indian breakfast recipes made with poha. Hey where r u using the tamarind, jaggery mixture, prepared in hot water? Can i add sugar instead of jaggery? Dry roast and grind to a coarse powder: (OPTIONAL)” ? how to make rasam powder at home? pls can u give the recipe? How do you wash Avalakki?slightly powdered Avalakki absorbs all water quickly and the black dirt remains as it is. pls help me solve this problem.